Ridgefield Park, NJ (May 10, 2012) – Samsung Techwin America, a leading supplier of advanced video surveillance solutions, announces new additions to its iPolis family of IP and network products. 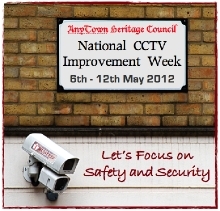 This new line of megapixel infrared (IR) cameras for outdoor use capture high resolution images in complete darkness. Available in domes and bullet cameras, the new models are IP66 rated for use in severe or varying weather conditions. Samsung iPOLiS SNV-7080R dome is an outdoor 3-megapixel network video camera that provides 16:9 full 1080p HD images and 15 built-in infrared (IR) LED illuminators for an IR viewable distance of 75 feet, even in total darkness. The IR camera uses Samsung's WiseNet2 DSP chipset, designed to provide maximum benefit for megapixel technology, including Wide Dynamic Range and Smart Compression with region-of-interest (ROI) encoding. H.264 compression ensures bandwidth-friendly, high-resolution images, and the H.264/MJPEG dual codec supplies multiple streaming. The camera includes a motorized 3 ~ 8.55mm (2.8x) vari focal lens to allow zoom and focus settings to be adjusted remotely after installation. Multiple resolutions include CIF (320 x 240 pixels), 1080p full HD (1,920 x 1080 pixels), and full 3 megapixels (2,048 x 1,536 pixels) with the ability to transmit selected streams for viewing and recording. 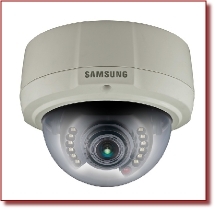 Samsung iPOLiS SNV-5080R fixed dome camera offers resolutions up to 1.3 megapixels, including 720p HD output; with an IR viewable range of up to 50 feet. H.264/MJPEG/MPEG-4 multiple codecs include multiple streaming, using H.264 compression for bandwidth-friendly, high-resolution images. Both exterior IR domes are IP66 environmentally rated for severe weather conditions. Samsung iPOLiS SNO-7080R is an outdoor bullet-style 3-megapixel network video surveillance camera incorporating 32 infrared LEDs to provide a viewing range of up to 150 feet in total darkness. Complete with a 2.8X varifocal motorized zoom lens; the SNO-7080R can capture 16:9 full HD images at 1920 x 1080p with wide dynamic range (WDR) and features a dual H.264 and MPEG codec. It is IP66 environmentally rated for severe or varying weather conditions and can be powered via PoE and 24V AC. Samsung iPOLiS SNO-5080R is a high performance 1.3-megapixel IP camera capable of displaying multiple resolutions from CIF (320 x 240) through 16:9 format 720p High Definition, to full 1.3 megapixel (1280 x 1024). It comes complete with high performance IR LEDs that illuminate objects up to 100 ft. away. It also includes a multi-stream H.264/ MPEG-4/ MJPEG codec.